This comprehensive book offers a unique and much needed examination of Asian immigration to the United States, focusing on three central questions: What causes Asian immigration to the United States? How do post-1965 Asian immigrants impact American society? How do new Asian immigrants and their children adapt to American life? 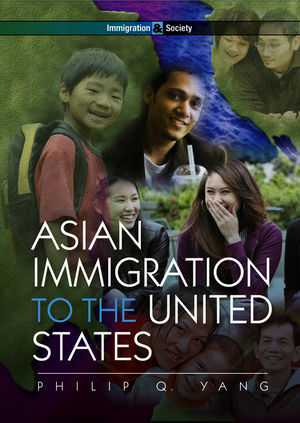 This is the first book that systematically delves into post-1965 Asian immigration to the United States and covers a wide range of issues, such as immigration causes and trends; settlement and adaptation patterns; types of immigrants; immigrant transnationalism; undocumented immigration; and the demographic, racial/ethnic, economic, sociocultural, and political impacts of Asian immigration. Importantly, the author develops a novel synthetic theory for explaining Asian immigration and demonstrates support for it in both historical and contemporary contexts. The book also provides a vast amount of the latest generalizable quantitative data on Asian immigration. Combining rigorous scholarship with engaging readability, Asian Immigration to the United States will be an invaluable text for college and graduate students of immigration, Asian American studies, and race and ethnicity, as well as an excellent reference book for scholars and policymakers. Philip Q. Yang is Professor of Sociology and Director of the Sociology Graduate Program at Texas Woman's University. 2. A Theory of Asian Immigration. 5. Impacts of Asian Immigration on U.S. Society. 6. Adaptation of Asian Immigrants and Their Children. "Asian Immigration to the United States is the first social science book that provides a very comprehensive and systematic examination of Asian immigration, especially since 1965, using theories, secondary sources, and empirical data. It is well balanced in theory and empirical data, is easy to read, and is an ideal textbook for undergraduate and graduate Asian American courses." "The content of this book is rich and balanced from a sociological perspective with a unique Asian American studies sensitivity. Professor Yang is an expert in the area of international migration and Asian immigration to the United States. His formal training in demography and methodology adds empirical sophistication and analytical rigor to existing literature on Asian immigration and immigrants." "Yang's Asian Immigration to the United States is a very fluid and accessible study. It is structurally sound and complete, and will be a very useful reference for researchers, students, policy-makers, and anyone who is interested in Asian immigration."